This is the first version. This document describes a multimodal system which implements the W3C Multimodal Architecture and gives an example of a simple multimodal application authored using various W3C markup languages, including SCXML, CCXML, VoiceXML 2.1 and HTML. This is the 2 July 2008 W3C Working Group Note of "Authoring Applications for the Multimodal Architecture". The Multimodal Interaction Working Group published an updated Working Draft of the "Multimodal Architecture and Interfaces" (MMI Architecture) [MMI-ARCH] on 14 April 2008. However, the Working Draft currently does not take a position on several aspects of multimodal applications. These include the startup phase, how components find each other, and message transport, all of which must be addressed in actual applications. In order to provide a concrete illustration of a multimodal application based on the Multimodal Architecture using current W3C technologies, the Working Group has prepared this Note. The goal of this Note is to make it easier to author concrete multimodal Web applications. This document represents the views of the group at the time of publication. The group is planning to enhance the MMI Architecture specification based on this Working Group Note if the feedback is positive. This document is one of a series produced by the Multimodal Interaction Working Group of the W3C Multimodal Interaction Activity. For more information about the Multimodal Interaction Activity, please see the Multimodal Interaction Activity statement. Comments for this specification are welcomed and should have a subject starting with the prefix '[AUTH]'. Please send them to www-multimodal@w3.org, the public email list for issues related to Multimodal. This list is archived and acceptance of this archiving policy is requested automatically upon first post. To subscribe to this list send an email to www-multimodal-request@w3.org with the word subscribe in the subject line. The W3C Multimodal Interaction (MMI) Working Group develops an architecture [MMI-ARCH] for the Multimodal Interaction framework [MMIF]. The Multimodal Architecture describes a general and flexible framework for interoperability of the various components of the multimodal framework (e.g. modality components and the interaction manager) in an abstract way. Among others it defines interfaces and messages between the constituents of the framework, but it is up to the implementation to decide how these messages are transferred in case of a distributed implementation. The intention of this document is to provide a proposal of how to implement a multimodal runtime environment as well as an application based on the W3C Multimodal Architecture using existing W3C technologies. 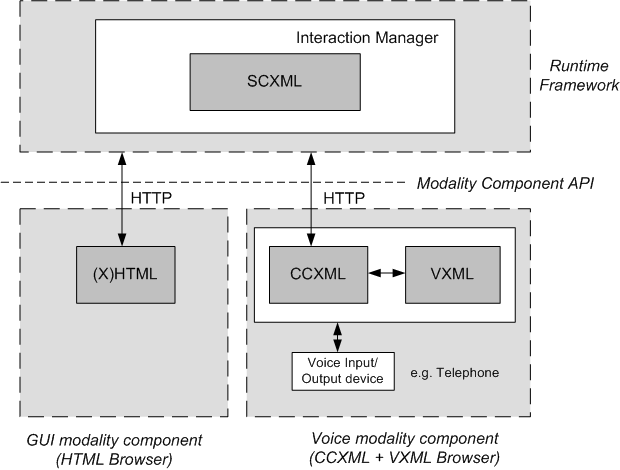 This proposal uses CCXML and VoiceXML to implement a voice modality component. Note that this is just one possibility for implementing it. Note: The W3C Voice Browser Working Group is currently developing VoiceXML 3.0 which is the next major release of VoiceXML and will enable voice browsers to fit into the W3C Multimodal Architecture as a modality component. As VoiceXML 3.0 implementations are not yet available, this document relies on the existing VoiceXML 2.1 specification [VoiceXML]. The Multimodal Interaction Working Group itself wants to learn from this authoring example where improvements are possible and necessary. We also intend to present how we think that multimodal applications will be authored in the future. Runtime Framework containing the Interaction Manager. Interaction Manager (IM) based on a state machine, described using [SCXML]. GUI Modality component based on [XHTML] and ECMAScript. Voice Modality component based on [VoiceXML] and [CCXML]. Modality component API based on HTTP (event transport) and XML (event representation). The dashed boxes correspond to (logical) components within the MMI architecture whereas solid lines correspond to actual software or hardware components used to implement the system. The voice input/output device shown in the figure above may be a regular (mobile) phone or a Voice-over-IP (soft) phone. In any case a phone connection to a standard voice browser is used. This section discusses one possible implementation of the Multimodal Architecture. The Runtime Framework provides the environment which hosts the SCXML interpreter. It has to provide an interface to receive events from external components (modality components) and must be able to inject these events into an existing SCXML session or to start SCXML interpreter sessions. The Runtime Framework also needs to provide the possibility to send events to external components (i.e. some implementation of the SCXML <send> tag). In the future this feature might be a covered by the "external communications module" of the SCXML specification ([SCXML]). An implementation of an SCXML interpreter written in Java is available open source from the Apache Software Foundation [Apache Commons SCXML]. One possibility for implementing a simple runtime framework could be to combine the Apache commons SCXML library [Apache Commons SCXML] with a J2EE servlet engine (e.g. [Apache Tomcat]). The servlet engine would be used to implement the HTTP I/O processor. Even though HTTP might not be the most efficient solution as a transport protocol, it still has some advantages. It is a widely used protocol and available in nearly every programming language. In a distributed scenario, where the Interaction Manger (i.e. Runtime Framework) and the modality components are spread across the network, proxy and firewall problems are easy to solve. Also, our intended modality components (HTML browsers for graphical modality and VoiceXML browsers for voice modality) inherently support HTTP. Therefore we use HTTP for this proof-of-concept implementation proposal. Other, more scalable solutions might make use of other protocols. 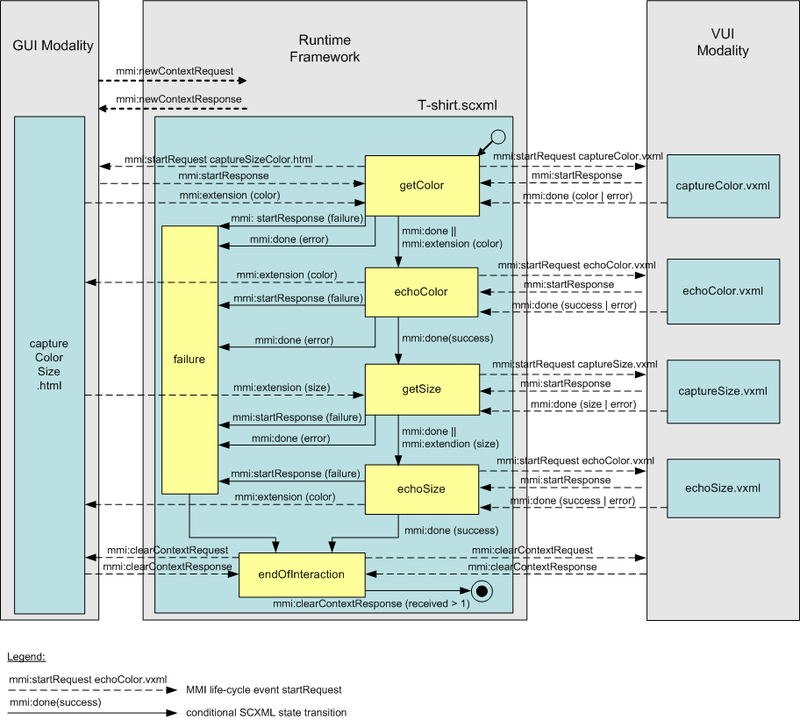 The Runtime Framework provides the I/O processor which receives HTTP requests from modality components (containing XML based life-cycle event representation). Based on the event semantics the Runtime Framework logic has either to start a new SCXML interpreter instance (when receiving a mmi:newContextRequest message) or to inject an event into a running SCXML interpreter instance. In this scenario in terms of transport the Runtime Framework acts as an HTTP server which receives HTTP requests and modality components are HTTP clients sending HTTP requests to the Runtime Framework. Therefore sending events from modality components to the Interaction Manager is relatively easy to implement using existing technologies. The multimodal runtime architecture also requires to send events from the Interaction Manger to the modality components asynchronously. To be able to leverage standard components like HTML and VoiceXML browsers as modality components (or modality component containers) events should still be transferred using HTTP (as HTML and VoiceXML browsers supporting the HTTP protocol natively). But the browsers act as HTTP clients only. Therefore the Interaction Manager has still the role of the HTTP server. According to the HTTP model the client has to initiate requests. To enable the Interaction Manager to send events to the modality component, the modality component therefore has to send HTTP requests to the Interaction Manager to ask for events. This technique is usually known as polling. Simple implementations have obvious drawbacks (e.g. increased network traffic, additional delay) but it is possible to optimize it to some extend (e.g. by blocking the HTTP request server side and using timeouts). This technique certainly has limitations for large scale implementations, but it is relatively easy to implement based on existing technologies and therefore a good choice for a proof-of-concept. Another promising approach could be [COMET] which uses long living HTTP connections to stream data to the client. Again the client has to open the HTTP connection. The server will stream an HTTP response to the client and leaves the HTTP connection open until the next event has to be sent to the client. Meanwhile there are a lot of applications out there using this server-push technology. Unfortunately this technology is not well standardized yet and therefore requires browser dependent implementations. But it is a potential solution for the required server-push channel. According to the rules defined for the Multimodal Architecture, the application logic resides within the Interaction Manager. Therefore the modality component has to send events (e.g. user initiated events like click or change) to the Interaction Manager. The Interaction Manager decides on possible reactions to this events and sends events to the modality component to instruct it to execute some action (e.g. displaying something). The modality component API may be implemented using [XMLHttpRequest] (also know as AJAX). Event handlers for user initiated events like change for text input elements and click events for button elements may easily convert these into XML representations (MMI life-cycle event representation, e.g. containing values of input fields) and sent them to the Interaction Manager using XMLHttpRequests. It should be mentioned, that the content of the <mmi:data> element is application specific. This approach requires to send an asynchronous XMLHttpRequest to the Runtime Framework (expecting the request to be blocked at the server) and to interpret the response accordingly: either taking any local action based on the event semantics and/or re-sending another request to the Runtime Framework. is the MMI lifecycle event. // In this example we receive the name of a function and the params. // This has to be evaluated locally using eval(). // send HTTP request to server to receive lifecycle event. else // check if contains "<mmi:"
// --> it is not a valid lifecycle event! The Voice Modality Component may be implemented using CCXML and VoiceXML 2.1. VoiceXML 2.1 does not provide an external eventing functionality. As CCXML 1.0 defines an external event interface (Basic HTTP Event I/O Processor), which allows to inject external events into a running CCXML session or to start new CCXML sessions, CCXML will therefore be used as a event bridge between VoiceXML and the Interaction Manager. CCXML will receive events from the Interaction Manager and - depending on the event semantics - start a VoiceXML dialog. VoiceXML will be used to implement the actual voice user interface (play prompt and control ASR). User input collected by VoiceXML will be returned to CCXML. CCXML has the ability to send HTTP requests to external components. This feature will be used to send events back to the multimodal runtime framework to inject events into the SCXML based Interaction Manager. Due to the fact that VoiceXML must return to CCXML (and hence exit) to return results (e.g. recognition results) the VoiceXML user interface has to be implemented as small independent scripts. Each script corresponds to a single action, like play a prompt or start grammar and listen to user input. Now, as we have described the basics of all constituents, we need to define the setup of a multimodal session. A multimodal session may be initiated using a GUI modality component. The user starts a web browser and loads a HTML document from a given URL. Upon load, the HTML document registers corresponding event handlers (e.g. for change events) and is able to send messages to the Interaction Manager using AJAX (i.e. XMLHttpRequests). The HTML document may contain a special text input field which is used to collect the users phone number or SIP URL. Once the user has entered this information it is sent (e.g. by pressing a corresponding button) to the Interaction Manager. The Interaction Manager generates a message towards the CCXML event processor to create a new CCXML session and to initiate a phone call to the given telephone number (or SIP URL). As soon as the telephone connection has been established successfully the multimodal session is initiated. Now the Interaction Manager is capable of controlling the two modalities by sending life-cycle events. This section ties together the previously described components to implement a sample application. The multimodal T-Shirt example contains a combined graphical and voice user interface and allows to fill in a form containing two fields (color and size) either by voice or by pen/keyboard. The following figure shows the corresponding state machine logic for this example together with the MMI life-cycle events. In this example we assume that the Runtime Framework supports the x-ajax and basichttp targettypes for the <send> tag. The GUI modality component uses AJAX to communicate to the Runtime Framework. Therefore we use x-ajax as the targettype, whereas the Voice modality component is implemented using CCXML/VoiceXML. As the external event interface of CCXML is used to inject events into the CCXML session we have to make use of the basichttp targettype. which holds the id and the value (in this case the color value) of the HTML object. event. The returned event is handled asynchronously within handleIncomingMmiEvents(). Finally the next MMI lifecycle event is fetched. // Start asynchronous XMLHttpRequest to receive MMI lifecycle event. // We assume that the the IM always returns a lifecycle event, i.e. // handleIncomingMmiEvents() will be called to evaluate the xml encoded event. The ECMAScript function _check(elementname, elementvalue) within captureColorSize.html is provided to check a radio button. To achieve this, the Interaction Manager sends a mmi:extension life-cycle event where the (application specific) eventType element within the <mmi:data> element is set to _check. The fieldValue element contains the HTML id of the corresponding object. The _check(...) function therefore simply uses the DOM API to activate the radio button. The following example shows the MMI life-cycle event to activate the green color radio button. This event is created within the SCXML script. See the getColor state of the SCXML sample code (5.1 T-Shirt.scxml). 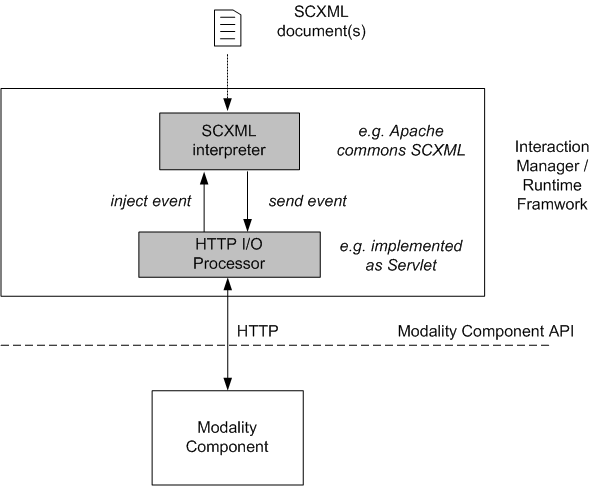 CCXML is used as a dispatcher of events between SCXML and VoiceXML. The script ccxml_events.js contains a collection of support functions to create MMI life-cycle events or to start VoiceXML dialogs. Note that this script is written to be application independent. <dialogstart src="_vxml.start(grammarUri, prompt, audio, fields)"
As mentioned in 3.3 Voice Modality Component VoiceXML must return to CCXML (and hence exit the VoiceXML dialog) to return results (e.g. recognition results). Therefore the VoiceXML user interfaces has to be implemented as small independent scripts. Each script corresponds to a single action, like play a prompt or start grammar and listen to user input. The following code sample shows how the captureColor.vxml document could look like. The script vxml_emma.js, which is referenced in the VoiceXML document, contains a collection of auxiliary ECMAScript functions to create an [EMMA] representation of the user input. See Appendix C of [EMMA] for more information of how to map a recognition result into an EMMA representation. Note that the other VoiceXML documents are very similar and therefore not shown here. The editor wishes to thank Jim Larson (Intervoice) from the Voice Browser Working Group for his contributions to the writing of this document and for many helpful comments. Apache Tomcat servlet container , The Apache Software Foundation, 2008. A Java SCXML engine , The Apache Software Foundation, 2008. "Voice Browser Call Control: CCXML Version 1.0 (Working Draft)" , R.J. Auburn, editor. CCXML, or the Call Control eXtensible Markup Language, is designed to provide telephony call control support for dialog systems, such as VoiceXML. World Wide Web Consortium, 2007. Comet Ajax server-push , Wikipedia. "Extensible multimodal Annotation markup language (EMMA)" , Michael Johnson et al. editors. EMMA is an XML format for annotating application specific interpretations of user input with information such as confidence scores, time stamps, input modality and alternative recognition hypotheses. World Wide Web Consortium, 2007. "Galaxy Communicator" , Galaxy Communicator is an open source hub and spoke architecture for constructing dialogue systems that was developed with funding from Defense Advanced Research Projects Agency (DARPA) of the United States Government. "Multimodal Architecture and Interfaces (Working Draft)" , Jim Barnett et al. editors. This specification describes a loosely coupled architecture for multimodal user interfaces, which allows for co-resident and distributed implementations, and focuses on the role of markup and scripting, and the use of well defined interfaces between its constituents. World Wide Web Consortium, 2008. "W3C Multimodal Interaction Framework" , James A. Larson, T.V. Raman and Dave Raggett, editors, World Wide Web Consortium, 2003. "W3C Multimodal Interaction Use Cases" , Emily Candell and Dave Raggett, editors, World Wide Web Consortium, 2002. "State Chart XML (SCXML): State Machine Notation for Control Abstraction (Working Draft)" , Jim Barnett et al. editors. SCXML, or the "State Chart extensible Markup Language", provides a generic state-machine based execution environment based on CCXML and Harel State Tables. World Wide Web Consortium, 2008. "Voice Extensible Markup Language (VoiceXML) Version 2.1" , Matt Oshry et al. editors. VoiceXML, the Voice Extensible Markup Language, is designed for creating audio dialogs that feature synthesized speech, digitized audio, recognition of spoken and DTMF key input, recording of spoken input, telephony, and mixed initiative conversations. Its major goal is to bring the advantages of Web-based development and content delivery to interactive voice response applications. World Wide Web Consortium, 2007.
" XHTML 1.0 The Extensible HyperText Markup Language (Second Edition)" , Steven Pemberton et al. editors. World Wide Web Consortium, 2004. The XMLHttpRequest Object (Working Draft) , Anne van Kesteren. World Wide Web Consortium, 2008.